· Use the app to submit engineering assignments/jobs and a photo directly and securely to Haag’s office from your job site with ease! · Use the built in inclinometer to measure the roof’s pitch from the roof or the ground. Plus, use the photo function to snap a picture of your pitch reading for your file. · Utilize Haag’s unique job checklists helps you look for the right clues, ask the right questions, or determine if you need another expert to consult on your loss! These one-of-a-kind checklists were written by Haag engineers to help you collect the right information the first time! · View up-to-date weather conditions and the 5 day extended forecast. · Check out quick links to Haag’s books and tools, and training classes. 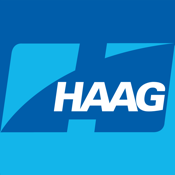 Keep Haag Engineering in your pocket and at your fingertips, with this free, handy app!